The Application Help DocumentationCoach/Professional Help Documentation Performance AlertsPerformance Alerts: can't create the specific alerts you need because you need additional fields to be added to your Event Forms? When you create a new performance alert for a numeric field you can select to be notified of anything from % change to a new personal best. However, most of the alerts are based on the last value entered to the next value. It does not work over a set number of days or a specific time period. 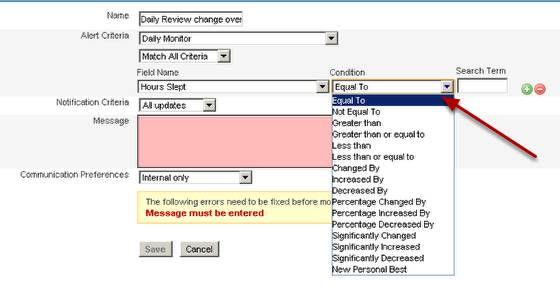 If you want to know if there has been a specific change over a certain time period then you need to ask your application Builder to set this up as a historic calculation IN the actual event form for you so that you can set up the performance alert for that specific field. 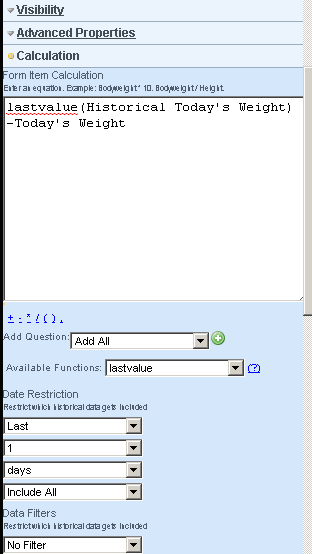 For this example we are calculating the difference from Yesterday's weight to today's weight. If there is no value entered for yesterday, the calculation will not calculate and the equation will be left blank. 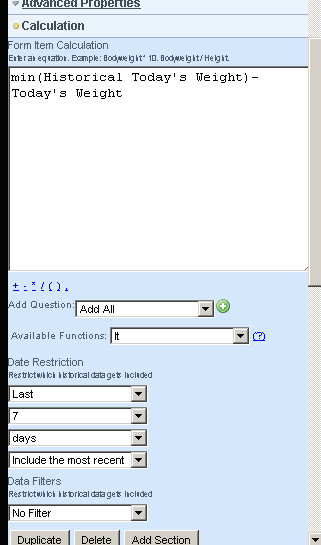 You can ask the Site Builder to add in field that calculate out differences over different time periods. Use the new historical fields to set meaningful alerts for your data. Another example of how historical calculations can be useful is looking at minimum ranges (like sleep below an average of 6 hours per month). Always go to into the event form and enter in a data for a test or demo athlete to ensure that the field is set up correctly in the form, and also that the performance alert is set up correctly. It may mean entering a months worth of fake date for one athlete, but it is better to get it right than miss the critical information that you need.